Beat the cream cheese in a bowl using a hand mixer until it's creamy. Add the eggs, juice, zest and beat for 1 minute. Add the rest of the ingredients and beat for one more minute. Let sit for 5 minutes. Heat 1 tablespoon of vegetable oil in a large saucepan of over medium-low heat. For each pancake, pour 1/3 cup of the mixture onto the saucepan. Cook until bubble appear on the surface then flip and cook for 1 to 2 minutes. Serve with a side of maple syrup or your favorite jam. Enjoy! 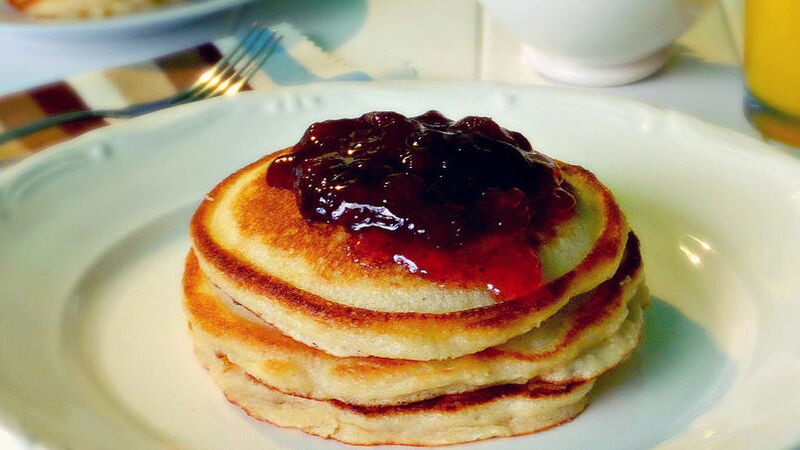 For a complete breakfast, serve the pancakes with a fresh fruit salad and a cup of milk or juice. The first recipe I prepared was a recipe for pancakes that was on the backside of a box of Bisquick™. I was only 9 years old and since I had no idea what a measuring cup or measuring spoon was, I found it easier to follow the instructions to prepare the whole content of the box. I don’t remember the size of the box, but I do remember preparing stacks and stacks of pancakes. Being surrounded by so many pancakes was a dream come true because I absolutely loved them. Thirty years later, I still love them all the same. I prepare them every weekend for my family and they love this recipe most. These cream cheese and lemon pancakes are spongy, light and they’re the perfect breakfast for a sunny spring morning.